The U.S. Supreme Court voted 5-4 this week to stay the implementation of the U.S. EPA’s Clean Power Plan, until the carbon rule has been fully reviewed on its merits. A federal appeals court in Washington, D.C. is currently reviewing the regulation, with oral arguments scheduled to begin on June 2. A final ruling is expected by the end of the year. Regardless of the outcome, the case will likely go to the Supreme Court, with either proponents or opponents challenging the appellate court’s decision. The stay issued this week is designed to halt implementation until the Supreme Court makes a final ruling. The stay itself could be a signal that the justices are leaning in favor of the Clean Power Plan (CPP) opponents. So what does this mean for states and businesses impacted by the CPP? For wind and solar companies, the decision doesn’t mean much -- right now. The renewable energy sector saw record capacity additions in 2015 as prices continued to fall, and the recent extensions of the federal Investment Tax Credit for solar and the federal Production Tax Credit for wind will continue to drive growth over the next five to seven years. However, the ITC and PTC extensions are intended to be a policy bridge until the CPP comes into effect. The stay creates uncertainty around what that bridge will lead to. The CPP compliance period officially begins in 2022. But states can receive early action credits for investing in renewable energy and energy efficiency in 2020, if they file compliance plans by September 2016. At the very least, the stay delays that timeline. “Approving this delay, I’m afraid, will create a chill in investment in the [clean energy] sector,” said Malcolm Woolf, vice president of policy and government affairs at Advanced Energy Economy. The CPP stands to mobilize millions and eventually billions of dollars into efficient power plants and technologies to replace power plants. Because these projects need to prove their worth for decades to come, energy companies are more likely to hold off on making long-term commitments until the Supreme Court decides the case two or three years from now, said Woolf. This could have an impact on some large-scale utility solar projects. 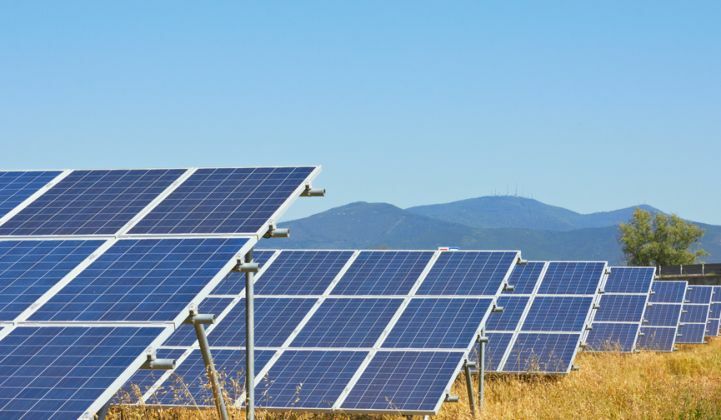 The 2019 and 2020 forecasts for utility solar stood to gain from early-action-eligible projects, especially for utilities that could also benefit from the 30 percent ITC eligible projects, according to Cory Honeyman, senior solar analyst at GTM Research. Utilities will be looking to their state leaders for how to plan. Among state leaders, there has been a wide range of responses to the CPP stay. Some states -- such as Texas, Kentucky and Wisconsin -- had refused to start work on an implementation plan and are now even less likely to take action. Other states that were challenging the rule, but had started to work on a plan nonetheless, have now decided to take a pause. Montana Governor Steve Bullock immediately canceled an advisory council meeting on the CPP scheduled for later this month, saying the state plans to address climate change “on our own terms.” Montana is required to make the steepest emissions cuts of any state -- 47 percent compared to 2012 levels by 2030. North Dakota, South Dakota and Nebraska have also called off meetings, according to E&E Publishing. Some states are continuing to weigh how they will proceed, such as Michigan and Arizona. Many other states intend to move forward. Seventeen states plus the District of Columbia have come out in support of the CPP and are actively involved in litigation to uphold it. 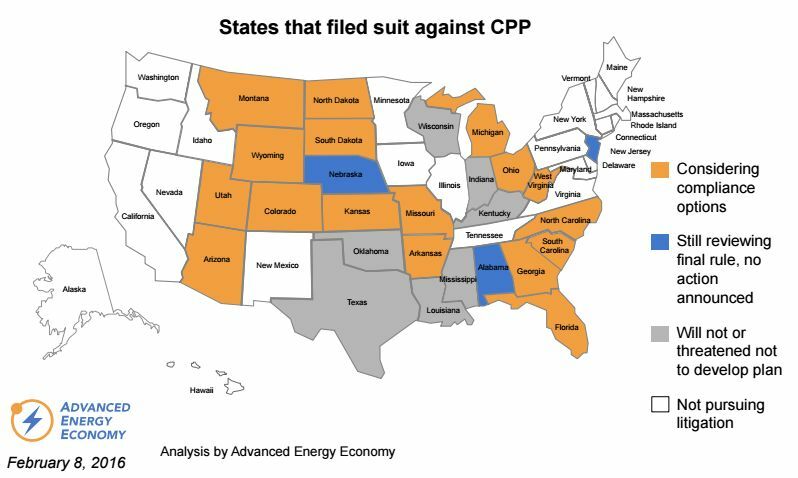 All of these states have either announced they will or are expected to continue work on CPP compliance. That list is made up of: California, Connecticut, Delaware, Hawaii, Illinois, Iowa, Maine, Maryland, Massachusetts, Minnesota, New Hampshire, New Mexico, New York, Oregon, Rhode Island, Vermont, Virginia, Washington state and Washington, D.C. Yet another group of states are actively opposing the CPP, but have decided to advance their compliance plans nonetheless, such as Wyoming and Colorado. “It is prudent for Colorado to move forward during the litigation to ensure that the state is not left at a disadvantage if the courts uphold all or part of the Clean Power Plan,” the Colorado Department of Public Health and Environment said in a statement. AEE compiled a list of states that are challenging the rule, but are also considering or have already started work on a compliance plan, shown below. According to a White House statement, the EPA intends to work with states that choose to continue planning “and will prepare the tools those states will need." Stakeholder discussions also persist. The National Association of Clean Air Agencies (NACAA), which represents regulators in 40 states charged with implementing the carbon rule, as well as the National Association of Regulatory Utility Commissioners and the National Association of State Energy Officials all decided to move ahead with a conference on complying with the CPP this week. Utilities have an important role to play in what happens over the coming months, Becker added. Utilities work closely with regulators and policymakers, and could encourage state leaders to advance a backup plan in the event the CPP is upheld -- the way Duke Energy has in North Carolina. But power providers stand divided on the carbon rule. Municipalities and co-ops are staunchly opposed, and have filed to sue. Some power companies, such as Pacific Gas & Electric, Calpine and NextEra Energy have filed in support. While others say the legality of the CPP has little effect on the transition to a lower carbon energy mix one way or the other. Quin Shea, vice president for environment at the Edison Electric Institute, which represents investor-owned utilities, said the CPP stay doesn’t really change anything. His industry will continue to make “significant investments” in a cleaner generation fleet and take meaningful actions to reduce greenhouse gas emissions. EEI’s members “are united in their focus on delivering the clean energy future that customers want and expect,” he said. At the DistribuTech conference, a major smart grid event, conversations were much more focused on getting deals done in the coming quarters than planning for the CPP in 2020, said Woolf, who attended the conference this week. “I don’t think it’s had much of a ripple here,” he said. For solar, the stay could push back a portion of forecast procurement and install volumes into the post-2020 timeframe, said GTM Research’s Honeyman. But at least through 2020, utility solar will still remain the primary driver of U.S. solar demand, thanks in large part to the federal ITC extension. “As PPA prices for utility solar become that much more competitive, the market will be supported by a number of drivers, including expedited coal retirements via additional EPA standards, natural-gas price hedging, renewable portfolio standards, federal PURPA legislation, and corporate procurement,” he said. All of these factors mean that the coal industry is still under intense pressure. However, the stay does offer some reprieve, said Michael Levi, senior fellow for energy and environment at the Council on Foreign Relations. For some, the real question now is what happens with respect to climate. Wind and solar companies may not need Obama's CPP to survive, but what about the Paris climate accord? The CPP is a central part of the U.S. commitment. If the regulation is ultimately thrown out, what happens in 2020 and beyond? Will clean energy solutions be able to scale fast enough in the coming years to meet the U.S. targets? This uncertainty “may reasonably cause concern to other countries,” said Robert Stavins, professor of business and government at Harvard University. This is especially true if the U.S. elects a Republican president, he said.